It was a big, fat lie. Two jokesters squeezed into one pair of pants to sneak into a movie theater as a single person with one ticket. 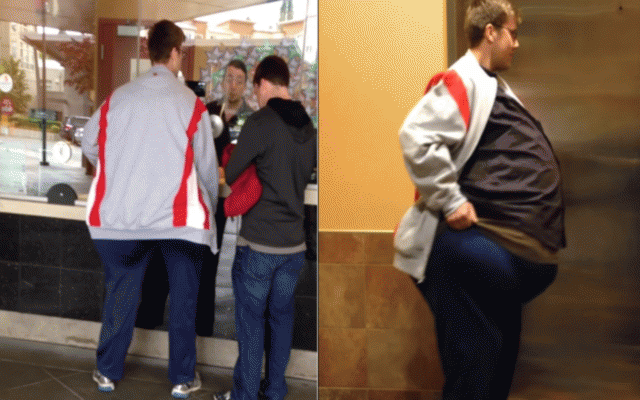 Best buds Bo and Matthew filmed themselves carrying out their elaborate transformation in a YouTube video that documented their hilarious waistgate scheme. After a couple failed attempts, one of the two men manages to cling to the other's chest, wrapping his legs around his buddy's waist. 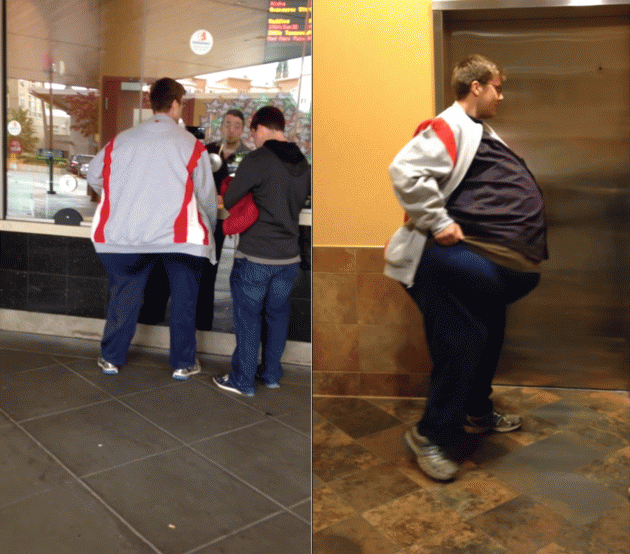 A large shirt and track jacket are then placed on top, making the giant bulge resemble a massive belly. Two men are seen sneaking into a movie theater with one ticket thanks to a clever disguise beneath a pair of jumbo-sized pants and T-shirt. They then practiced their walk and talk before heading to the theater. "We'd like one ticket for the Avengers, please," the face of the operation practiced. "What do you mean, 'We'?" a muffled voice corrects. Their clever getup fooled the theater's staff and earned them a spot on Reddit's front page Monday. Their video has since been viewed more than 17,000 times. We don't know where or when they pulled this off. We don't even know the culprits' full names, so the joke might be on us. But we give them points for creativity.